Being a lurker in Reddit's makeup and skincare subreddits, I have discovered tons of acronyms about makeup and the like. Today I'm introducing you to one: MLBB! MLBB simply means "My Lips But Better". I've always been a look-out for great lippies that give a hint of shade and shine, and something wearable on a daily basis (READ: fit for the office). 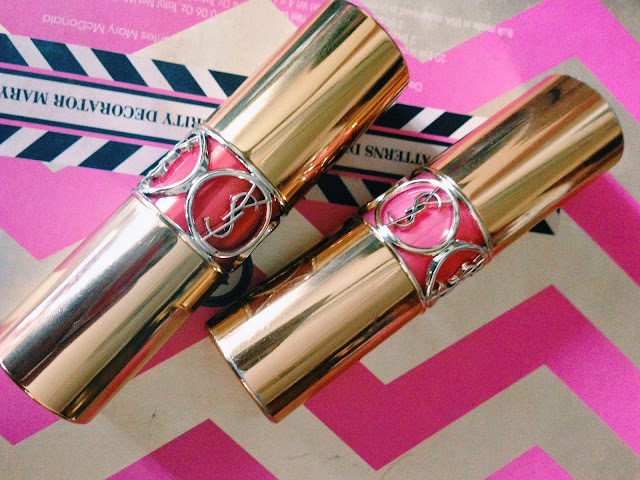 I have discovered YSL's Rouge Volupte Shine lippies and since then, I'm hooked! I've been using it as my daily lippie ever since. I love that it smells nice (and if you have to ask, tastes nice too, haha!). Having sensitive skin (and a sensitive nose too! ), I tend to choose light-formula makeup which doesn't taste or feel like it was makeup. You know what I mean, right? The ones with the thick, and makeup/chemical smells usually turns me off. But well, that's just me. I love that YSL's volupte shine lippies are also hydrating, moisturizing and non-drying, so that's one thing I don't have to worry about. It gives a shine finish, so I don't have to think about layering with gloss or balm anymore. The color is pigmented, so a little tap goes a long way. It also helps that the packaging is so luxe and chic, and you can see the shade without checking the label underneath or opening the tube. Because of its shine texture, it won't last long, maybe up to 3-4 hours then I'd be left with a tinge of color (ala stained effect) on my lips. I'm still starting my YSL lippies collection, but so far, here's the two colors that I find which matches my skintone best (I'm an NC35). I am so happy that these two shades would easily pass off as my MLBB shades. So here they are: YSL Rouge Volupte Shine in #13 (Pink in Paris) and #16 (Orange Impertinent). #13 Pink in Paris is a muted/dried rose pink color. I find it gives me the perfect pinkish tinge without going overboard. #16 Orange Impertinent is a true coral with a hint of tan. Truth be told, this was not what I would pick up for myself but it turned out to be a wonderful shade. I find myself grabbing these two on a regular basis, which isn't really a surprise because I've raved about it so much earlier. I look forward to get some more YSL volupte shine lippies just because but I just can't point my finger what shade to go for next.